Gigi Pasley knows the impact of cancer. When she was two-years-old, her twin sister Jade, died after a bone marrow transplant to cure her of Acute Myelogenous Leukemia (AML). During the same time her twin sister was undergoing the bone marrow transplant, Gigi began chemotherapy for the same form of cancer. Gigi’s battle with cancer did not stop there. After two relapses followed by two separate bone marrow transplants, the then 10-year-old developed a secondary cancer called osteosarcoma in her left femur. Now a four-time cancer survivor, Gigi, 16, is a junior at Centennial High School in Franklin, TN. 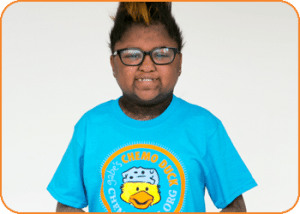 She is one of the seven cartoon characters featured in the Chemo Duck program to encourage, support and educate patients during treatment through play therapy.“I think it is really important to not over complicate things,” said Gigi. “I know that diseases can be complicated and confusing. But the people, who have the disease, need to be able to comprehend in the simplest terms what is happening to them. Gigi said it is so important that Chemo Duck is cuddly and plush because oftentimes the medical environment that patients are required to be a part of for treatment and care can be frightening. “All of the medications, treatments and rules are there to help you to get better, but it can be really, really hard and super strict,” recalled Gigi. “When most of the tools and things a patient must experience are not happy, Chemo Duck is something a doctor can use that can be like a security blanket. Gigi hopes to become a child life specialist, a trained professional with expertise in helping children and their families in healthcare settings overcome life’s most challenging events. Child life specialists promote effective coping through play, preparation, education, and self-expression activities and utilize Chemo Duck in daily practice with their cancer patients. All of us at Gabe’s Chemo Duck Program support Gigi in her mission and are thrilled to have her on our team!